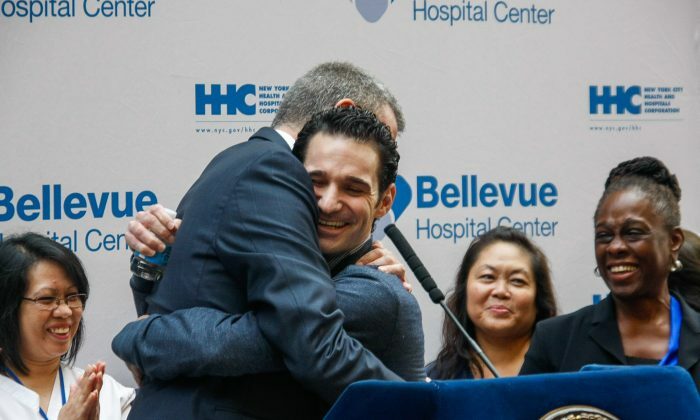 NEW YORK—To cheers and applause a slim figure of a doctor with curly short hair took the microphone Tuesday in the lobby of Manhattan’s Bellevue Hospital. Spencer’s recovery was not easy. About 100 staff at Bellevue Hospital cared for him. His cutting-edge treatment involved consultation with experts around the nation, and he received continuous support from his family and multiple medical institutions—even the city’s administration. This contrasts with the situation in Liberia, Guinea, and Sierra Leone, the West African nations at the epicenter of the Ebola epidemic. Over 13,000 people there are infected with the deadly disease. “The international response, while robust, has yet to fully break the viruses’ chain of transmission,” said Sophie Delaunay, executive director of Doctors Without Borders (MSF), an organization at the forefront of the battle with 3,500 medical professionals in the three most affected states. Craig Spencer was volunteering with MSF in Guinea for a month, starting on Sept. 16. “I cried as I held children who were not strong enough to survive the virus,” he said at the press conference. But he also experienced the joy of patients being cured. Ebola is transmitted through contact with bodily fluids. In the first stage, with symptoms like fever and headaches, blood and feces are infectious. In the latter stages, when bleeding from different parts of the body often occurs, even sweat and saliva are infectious. Spencer returned to New York on Oct. 16. He didn’t have any symptoms at the time, but he continued to monitor his temperature, as per MSF protocol. On the morning of Oct. 23rd he discovered he had a fever and reported it to MSF, who then contacted the city’s health department. He was then immediately transported to Bellevue. A positive test for Ebola came the same day. Since he told the authorities he was feeling sluggish for two days already, health department investigators retraced his steps and put three people in quarantine. Only one of them, his fiancé, is still quarantined, but she is scheduled for release Nov. 14. Authorities confirmed that plasma treatment was used to treat Spencer. Transfusing the blood from an infection survivor who may have developed antibodies for the virus into a patient suffering from the infection is still an experimental and unproven treatment. City Health Commissioner Mary Bassett also emphasized that basic care, such as maintaining fluid intake, as well as blood transfusions, contributed greatly to Spencer’s recovery. Blood and fluid loss are common causes of death for Ebola patients. Spencer looked healthy and in good spirits as he walked into the hospital lobby. A number of dignitaries, including the mayor, his wife Chirlane McCray, the health commissioner, and many others were there to welcome him. Spencer said he is proud to have worked with MSF. He also thanked Bellevue staff for the support and care he received. He requested privacy for himself and his family, saying he won’t speak publicly beyond his prepared remarks Tuesday.